" 'Big Government Tyranny' (Building Codes, Regulations) Saved Countless Lives in Japan	"
We still do not know what the full death toll will be from Japan's record 8.9 magnitude earthquake last night, and the extraordinary tsunami which followed it. (See videos in our breaking coverage last night here. See extraordinary TPM slide-show here.) Current reports estimate the number of deaths to exceed 1,000 and even that seems very conservative at this hour. But one thing is clear: Japan's "Big Government Tyranny" --- the type Republicans in DC are trying to kill, as opposed to the type they are maniacally expanding in Wisconsin --- saved hundreds of thousands, if not millions of lives last night. From seawalls that line stretches of Japan’s coastline, to skyscrapers that sway to absorb earthquakes, to building codes that are among the world’s most rigorous, no country may be better prepared to withstand earthquakes than Japan. Had any other populous country suffered the 8.9 magnitude earthquake that shook Japan on Friday, tens of thousands of people might already be counted among the dead. 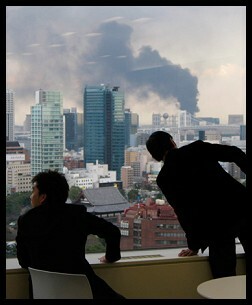 So far, Japan’s death toll is in the hundreds, although it is certain to rise. Over the years, Japan has spent billions of dollars developing the most advanced technology against earthquakes and tsunamis. The continuing resolution passed by the GOP House, the one that just failed in the Senate, reduces funding for the federal agencies that monitor and react to disasters. The CR is here. According to the House Appropriation Committee's summary of the bill, the CR funds Operations, Research and Facilities for the National Oceanic Atmospheric Association with $454.3 million less than it got in FY2010; this represents a $450.3 million cut from what the president's never-passed FY2011 budget was requesting. The National Weather Service, of course, is part of NOAA --- its funding drops by $126 million. The CR also reduces funding for FEMA management by $24.3 million off of the FY2010 budget, and reduces that appropriation by $783.3 million for FEMA state and local programs. Democrats did attempt to add more money to NOAA's budget. Rep. Dan Lipinski, D-Ill., offered an amendment to the CR that would have directed "no less than $710,641,000 to the National Weather Service Local Warnings and Forecasts." The amendment was one of several Democratic spending proposals that was found to be out of order, and not voted on. CBS reports: "The GOP budget plan that passed through the House last month aimed to cut funding for a tsunami warning center that issued a slew of warnings around Japan's devastating earthquake." As to the nuclear plants the GOP (and Obama) are pushing in this country, we'll just hope the "small radiation leak from a nuclear reactor whose cooling system was knocked by Friday's massive earthquake" is as "small" as Reuters is currently reporting. The U.S. Air Force has reportedly delivered "coolant" to the plant today. Four nuclear plants were taken off line last night following the quake. "Nuclear emergencies" were declared for two of them, with little more information given. The one of major concern right now is the Fukushima plant, 150 miles north of Tokyo where, last night, officials were cryptically saying that attempts to cool the plant were "not going as planned". Nuclear Energy for America: What Could Possibly Go Wrong? Herman adds Kyodo is reporting "This suggests radioactive steam could spread around the facility." UPDATE 6:24pm PT: Okay, this seems to be getting bad enough, as new news has come in throughout the day, that the nuclear emergency here clearly deserves its own item. I've moved the previous UPDATES on this item, and new ones beyond it, to this article devoted to the nuke developments. « PREVIOUS STORY "BREAKING: 8.9 MAG. EARTHQUAKE, TSUNAMI STRIKES JAPAN - VIDEO, TSUNAMI MAPS"
"'Big Government Tyranny' (Building Codes, Regulations) Saved Countless Lives in Japan"
THANK YOU for saying that. You'd think they'd be able to connect the dots, but these dolts just parrot back the same stupid sh:t their Kochtopus and Murdoch friends tell them to. Having lived in So Cal and worked in Woodland Hills during the Northridge earthquake, I'm glad for those building codes. Nonetheless, we can't be too complacent--the Japan quake was much much stronger. Here's what went on inside the buildings. The guy swears pretty decently for English being his second language. and running in 1975." Which kind of puts your thesis on shaky ground, like those buildings. There are plenty of ways to pillory RWers without resort to the risible notion that they don't want earthquake-resistant buildings. NSWFM, you and Brad pathetically try to tie the horrible tragedy in Japan to your knee-jerk political hatred. FYI, Ronald Reagan - one of those eeeevil Repubs - established the Governor's Earthquake Council in 1972, which led to the creation of the Seismic Safety Commission for whose building codes you are so grateful. This legislation was passed unanimously in the CA Assembly in 1974. 30 of those 68 legislators were - wait for it - eeevil Repubs. Poor you. More useful idiots. What a couple of tools. Excellent reasoning, Brad. Informed, too. This will put them dumb Republicans in their place. Don't you guys think you should give credit to the blogger, "JammieWearingFool" who supplied your silly argument and sent you here? Seems only polite. And honest. Aside from his/her disingenuous recap of this article ("Obvious message: Republicans don't use highrise buildings, therefore they don't care if 'millions of lives' are lost." Huh??? ), what does Ronald Reagan have to do with anything, and who said he was "evil"? That said, for the record, I'm surprised to see you're so supportive of a cut-and-runner Lefty like Reagan who raised taxes so many times, blew out the deficit and the size of the government. If he was running your party again, you all would likely be in much better shape. Well, America would any way. Peace! And thanks for the traffic! 21st Century wing-nuts have gone well beyond anything that would pass for rational proposals amongst even the likes of Reagan in the early '70s. During that same period, the 1970s, it was Richard Nixon who pressed for the same Environmental Protection Agency that today's House Republicans are seeking to demolish. The difference then, and now, is that whack right-wing billionaires, like the Koch brothers, and the corporations they run, exert far greater control over the body-politic, and over pseudo-grass-roots organizations like the "Tea Party," preaching Orwellian concepts, including the claim that all government regulations are bad; that unfettered and unchecked, dictatorial corporate power is the very essence of "freedom" and "liberty." Of course, whether you are paid trolls or simply "blinded-by-the-right" followers, Brad's article, which exposed the sheer madness of 21st Century "Tea Party" philosophy, grates on your already closed, and thoroughly indoctrinated minds. Through superior firepower! And welcome to my blacklist! c'est tres effrayant de voir tout se qui c'est passe au Japon.